Our first true stop after leaving Alaska was at Mount Robson Provincial Park on the border of British Columbia and Alberta. Mt. Robson is the highest point in the Rocky Mountain Range, so it was a must see for us. We allotted two nights at Mt. Robson before moving on to Jasper, so we had one full day to hike as much as we could of the Berg Lake Trail - the most popular trail in the park. We knew it would not be possible to hike all the way to Berg Lake and back, but we wanted to go as far as we could. The trailhead was a mere 2 kilometers from our campsite, so we opted to walk to it rather than break down camp and drive. Once we reached the trailhead, the adventure began. The ground was relatively level, and there were no switchbacks to be conquered this time. We walked in the forest along the Robson River, which had the blue coloring of the glacial rivers we had come accustomed to seeing. The hike offered amazing views of the backside of Mt. Robson, although much of it was under the cover of towering trees. 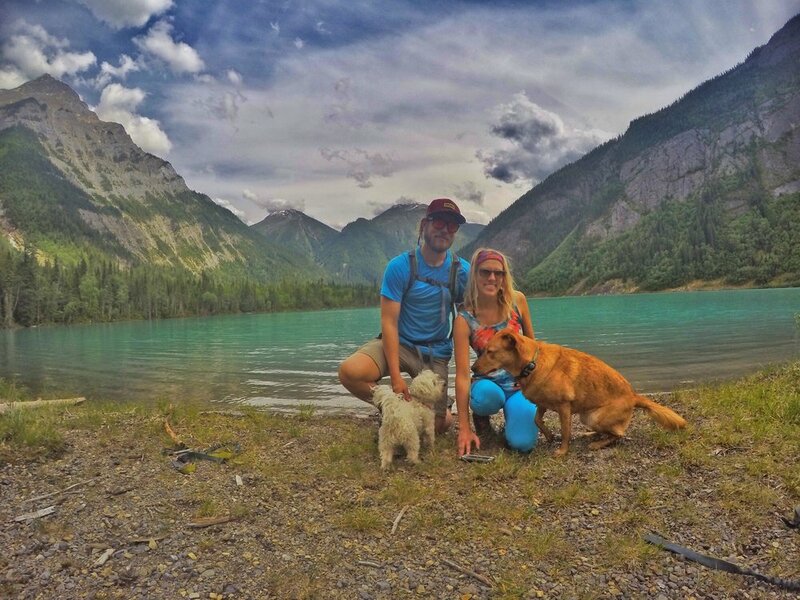 After several miles of trail, we aimed to make it to Kinney Lake where we could eat our delicious lunch and let Mila get in some quality swimming time before having to head back to camp. There were a few parts of the trail where we had to walk over fallen logs to make it across spontaneous creeks caused by flooding. On our way back, we passed two hikers who were soaked up to their hips and asked us how we made it across the rushing stream. We told them we walked across a fallen log and somewhat giggled at how they hadn't thought of doing it themselves. Then we made it to the now gushing river and instantly felt bad for judging them. The water must have washed the log downstream. By the time we got back it was just before nightfall, so we cooked up some chili and headed to bed to get ready for Jasper in the morning.